In the US, the requests rose by 26% from the last six months of 2016 to the first six months of 2017, while globally, requests increased by about 21%. 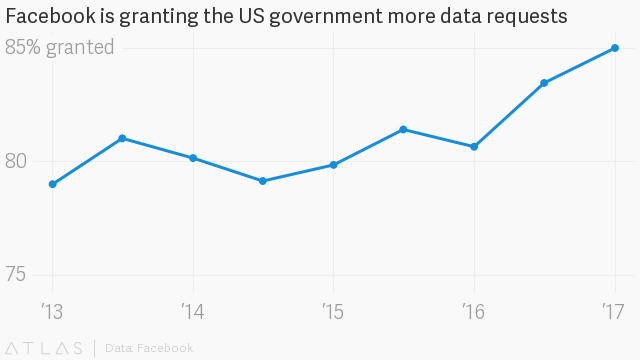 Since 2013, when the company first started providing data on government requests, the US number has been steadily rising—it has roughly tripled in a period of four years. Facebook has also been more forthcoming. In the first six months of 2013, it granted the government—which includes the police—79% of requests (“some data was produced” in these cases, the company says); in the first six months of 2017, that share rose to 85%. 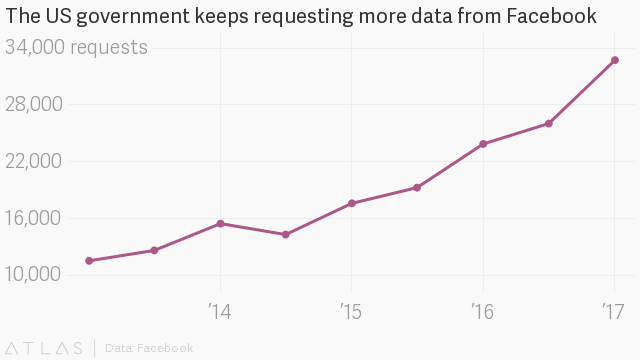 Facebook also says that 57% of the requests they got from US law enforcement included a non-disclosure order that bans the company from telling the user that their data was requested. This type of secret request was up by a whopping 50% from the last six months of 2016, but it’s unclear why. Quartz reached out to Facebook for comment. More than 1,800 requests were so-called “emergency disclosures,” which are granted to law enforcement on a case-by-case basis, and are a subject of some controversy. They include, for instance, requests to suspend someone’s account, as was the case with Korryn Gaines, a 23-year-old mother who was shot and killed by police in 2016, after she reportedly threatened officers with a weapon. She was broadcasting her confrontation on Facebook, and police asked the company to shut down her account, saying that other users were egging her on. As Quartz reported, law enforcement says it is the best judge of such situations and would like to have greater control over access to digital evidence than they do now. Privacy activists would rather leave some discretion to the companies—but would also like to see more transparency in Facebook’s policies.